Wonder material graphene exhibits different properties in humid conditions, say scientists from Queen Mary University London. Researchers from Zhejiang University (China), the University of Birmingham (England), and Queen Mary University of London wrote about their study in the journal Physical Review B (citation below). The authors were A. Qadir, Y. W. Sun, W. Liu, P. Goldberg Oppenheimer, Y. Xu, C. J. Humphreys, and D. J. Dunstan. The authors showed that in bi-layer graphene, when it is humid, water seeps between the layers. Bi-layer, in this context, means two sheets of atom-thick carbon, one on top of the other. Graphene’s properties depend significantly on how the layers of carbon interact with each other. When water enters between the layers, it can modify the interaction. The scientists found that at 22% relative humidity, water formed an atomically thin layer. And at separate graphene layers, water formed at 50% or higher relative humidity. The study findings suggest that in places like Manchester, UK, layered graphene could exhibit very different properties. Average relative humidity in Manchester is more than 80% every month of the year. In Tucson, Arizona, on the other hand, average relative humidity is 13% in the afternoon. However, in January mornings, it rises to 65%. In Tucson, therefore, graphene’s properties won’t be the same all year round. The authors suggest that the same may also occur with boron nitride and molybdenum disulphide (USA: disulfide), and other layered materials. Sheets of boron nitride and molybdenum disulphide are made of boron and nitrogen and molybdenum and sulphur (USA: sulfur) respectively. The researchers knew that graphite, which is also made from carbon, becomes less lubricant in low humidity conditions. Aboard an airplane at high altitude, for example, humidity is very low. This graphite trait encouraged them to carry out this latest study. Scientists believed that water in between graphite layers was crucial to its behaviour (USA: behavior). This latest study has shown that layered graphene is similarly affected. 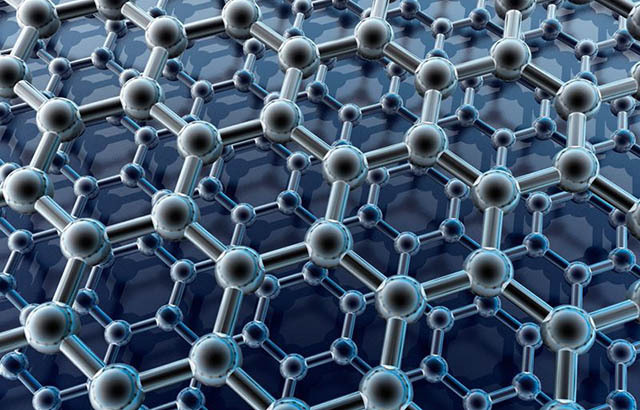 Graphene is the lightest, thinnest, and strongest material in the world. It is approximately two hundred times stronger than our strongest steel. Graphene is also the world’s best conductor of electricity and heat. It consists of a single layer of pure carbons arranged in a hexagonal (six-sided) lattice pattern. It is so thin that scientists describe it as two-dimensional. “Effect of humidity on the interlayer interaction of bilayer graphene,” A. Qadir, Y. W. Sun, W. Liu, P. Goldberg Oppenheimer, Y. Xu, C. J. Humphreys, and D. J. Dunstan. Physical Review B 99, 045402 – Published 2 January 2019. DOI: https://doi.org/10.1103/PhysRevB.99.045402.